Face ID uses machine learning algorithms and the Neural Engine built into the iPhone’s processor to analyze and recognize scans of the user’s face made by the TrueDepth camera system, the array of sensors located in the notch at the top of the screen. In the unlocking process, the iPhone has to make a depth map of the user’s face using the sensors, which is then compared with a mathematical representation of the registered user’s face stored in the Secure Enclave, a task that can largely be improved just by increasing processing performance. Along with other processor-related improvements expected from the A12 chip in the 2018 releases, the Neural Engine has been upgraded from a dual-core design to an 8-core version, making it capable of running at 5 trillion operations per second than the 600 billion operations offered by the version in the A11. By this measure alone, this should make a Face ID check take less time, but Apple has also claimed that the Face ID algorithms in the new phones are faster as well. The only real way to find out is to put last year’s iPhone X up against the iPhone XS and to see if there is much of a difference. To make the tests as fair as possible, my face was rescanned on both phones under the exact same lighting conditions. While the iPhone X will have updated its stored depth map data over time, it would be best for testing purposes if both devices share as close to identical data as possible. To determine a winner in each case, footage of the unlocking process was examined frame-by-frame, to see which completed the home screen animation first. For the initial 15-round run, the iPhone XS was fastest 11 times, a tie was declared 4 times, and the iPhone X failed to finish first at all. 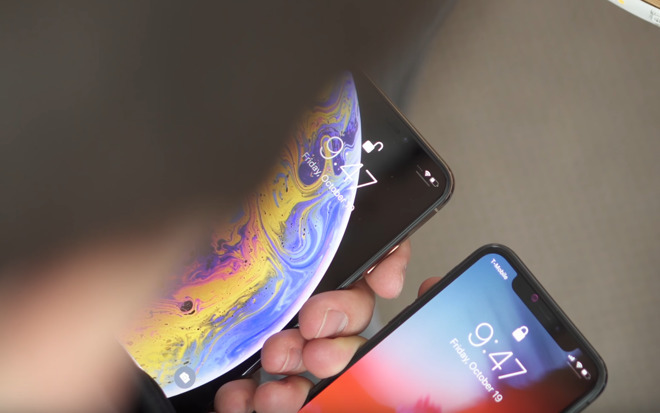 While the test revealed the second-generation Face ID is generally faster than the first-generation version, the fact that it had to be checked on a frame-by-frame basis strongly suggests most users won’t notice a sudden jump in performance just by looking at it. The same test was conducted again, but under low light conditions. In this second trial, not only did the iPhone XS win every single time, but in three instances out of seven, it was very noticeable, even without slowing the video down. It seems that darker conditions give the newer models an advantage. Lastly, it was decided to try and find issues with Face ID just by trying to unlock at weird angles to the face, and in the process discovered a weak spot for the iPhone X while holding it near the user’s legs. While the iPhone XS unlocked every single time in this situation, the iPhone X had to be lifted up a bit in order to unlock. Other than that single situation, both iPhones did equally well for practically all tested angles. So let’s answer the original question: is the second-generation Face ID on the iPhone XS, XS Max, and XR faster than the first-generation version used on the iPhone X? Yes, it is, but for the majority of real-world situations, it won’t make that much of a difference to most people. There was a bigger improvement in low light, but it’s still not that much faster overall. It seems that Face ID is just as usable as before, and probably just as secure, but only a hair faster. Further tests are planned for the iPhone XR, which AppleInsider will be putting through its paces soon, but given the similar specifications, it is probably going to be a similar story as for the iPhone XS for Face ID. If you haven’t already ordered Apple’s iPhone XS or XS Max, wireless carriers are incentivizing the purchase. Want to get your hands on a new device asap? eBay sellers are also shipping units now. Verizon Wireless: Buy an iPhone XS or XS Max and save up to $300 with a qualifying trade. Keep up with AppleInsider’s coverage by downloading the AppleInsider app for iOS, and follow us on YouTube, Twitter @appleinsider and Facebook for live, late-breaking coverage. You can also check out our official Instagram account for exclusive photos.